A wonderful expansion on a heroine we all know and love. 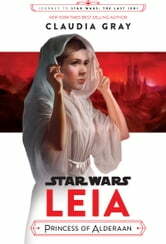 This is a fantastic novel that helps Star Wars fans understand exactly how the orphaned twin daughter Of Anakin Skywalker becomes Princess Leia Organa of Alderaan. Claudia Gray really knows how to write Leia. Whether it be Bloodline or this novel, there is something special she brings to the character, and the overall lore of Alderaan, which was (unfortunately) missing in the films. Claudia Gray returns to the character of Princess Leia and does a good job showing how Leia became who she was in Star Wars Episode IV: A New Hope. Books featuring original trilogy characters living in the prequel era are always interesting, and seeing how "General Leia" is born is great. It is intended for the Young Adult demographic, but as an adult it was still very enjoyable and didn't feel too "simple" in its writing. I liked Gray's "Bloodline" more, but this is still pretty great.